How To Treat Upper and Middle Back Pain? How To Get Rid of Upper & Middle Back Pain? Back pain can significantly affect our lives, limit our mobility and prevent us from doing various everyday tasks like we used to. Therefore, in order to ensure optimal health and mobility, we have to tackle the issue and start treating back pain immediately. This article will show you how to treat upper and middle back pain effectively. Upper and middle back pain can occur anywhere from the base of your neck to the bottom of the rib cage. Your ribs are attached to a long and flat bone that is located in the center of the chest or sternum and they also attach to and wrap around your back. Therefore, if a nerve in this area is irritated, pinched, or injured you may also feel pain in other parts of your body where this nerve travels e.g. arms, belly, chest, and legs. Discs – they separate each vertebra and absorb shock as you move. The sensation of pain in upper and middle back isn’t as often as pain in lower back pain or neck pain mostly because the bones in this area of the back don’t flex or move as much as bones in lower back or neck. 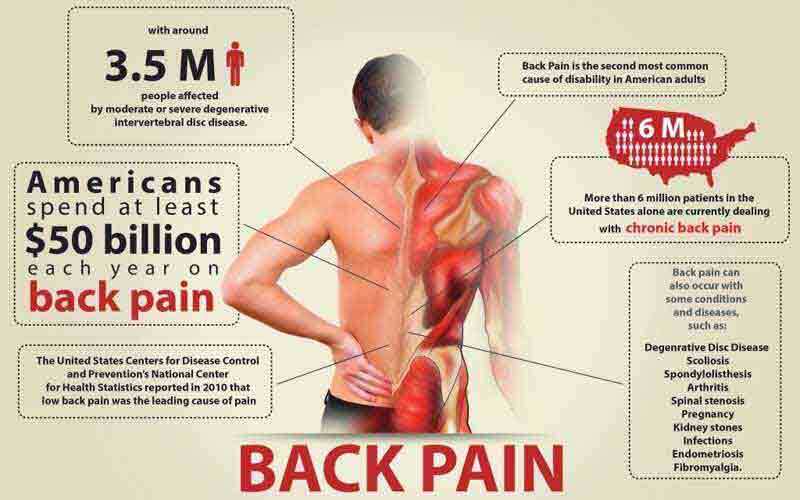 However, back pain affects a great majority of people. According to American Chiropractic Association (ACA) one-half of working Americans report experiencing back pain symptoms each year. Furthermore, back pain is one of the most common reasons for missed work; also it is the second most common reason for visits to doctor’s office. Other stats provided by ACA show that Americans spend at least $50 million each year on back pain and it is estimated that at least 80% of American population will experience some sort of back pain in some stage of their lives. Myofascial pain which affects the connective tissue of one or multiple muscles. What are the symptoms of upper and middle back pain? The pain aggravates when you do certain activities, or even move or sit in a certain way. NOTE: If you experience these more serious symptoms along with symptoms of upper and middle back pain described above, you should see your doctor and treat the problem right away. How is upper and middle back pain treated? How well other treatments have worked (if you experienced this type of pain before). Steroid injections that reduce the swelling and relieve the pressure on nerves and nerve roots. Surgery – is only recommended in the most extreme cases when other treatments don’t work. Use medications – for mild to moderate pain your doctor will recommend using over-the-counter medications that will help relieve the pain. You can also use supplements aimed at protecting, strengthening and improving the range of motions for joints. 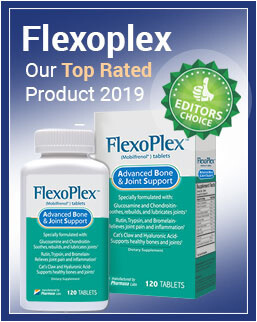 For example, FlexoPlex is a supplement formulated from natural ingredients and intended to provide lubrication for your joints, reduce inflammation, minimize joint pain, strengthen joint cartilage, and ease joint movements. Benefit of the product is in its ability to provide fast-acting relief against the pain thus improving your mobility and allowing you perform daily tasks. Natural ingredients from FlexoPlex inhibit pain sensors and reduce swellings and inflammations. Furthermore, the product has positive customer reviews which only speak about its effectiveness. Physical Therapy – Your doctor may suggest it in order to increase your flexibility, strength and balance, plus your physical therapist will also teach you how to perform same exercises at home. Acupuncture – Promotes healing and pain relief. Avoid lifting heavy objects; if you really need to lift it (in case there’s nobody else around) lift with your knees i.e. transmit all strength onto your knees and keep the object close to your body and try not to twist when lifting it. Although upper and middle back pain doesn’t occur as often as lower back or neck pain, it can still have a significant impact on our lives. Luckily, the problem can be easily treated with usage of medications or supplements that improve mobility, low-impact exercises, massage or even acupuncture. It is important to remain active, you should ask fitness trainer or physical therapist to create list of exercises you can perform.